The probes bind to dead and dying cells making them useful for detecting acute cell injury and cell death. When the active component of this molecule is attached to a radioactive tracer, it can be used in nuclear medicine imaging techniques, such as PET (positron emission tomography) or SPECT (single photon emission computed tomography), to produce three-dimensional images of where this cell death is occurring. “We are pleased to be working with GE on this technology,” said Dennis Devitt, the director of marketing and licensing for the Office of Technology Development (OTD), the technology transfer arm of the Medical College. “Working with the market leader in medical imaging allows this technology to be quickly moved from the research laboratory into patient care,” Devitt said. The ability to image dead and dying cells can have major clinical benefits, pointed out Dr. Zhao. 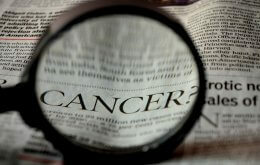 For example, it could allow oncologists to rapidly monitor tumor response to a specific therapy. Another potential application is for rapid diagnosis of myocardial infarction. Often patients come into ER complaining of chest pain and need to have an expensive overnight hospital stay so they can be monitored while their lab results are being processed. This compound could allow clinicians to non-invasively image the heart and determine within a few hours if the patient actually had a heart attack or something else. Joseph Hill, vice president for technology development, added that Dr. Zhao’s research was supported by a “Proof-of-Concept” grant administered by the College’s OTD. They have filed several patent applications on the technology. The OTD patents intellectual property generated by faculty and staff at the Medical College and licenses it in line with its mission to commercialize as many inventions as possible to help patients. Its “Patents to PatientsSM” brand best describes its mission.